Soundgarden. Audioslave. Casino Royale. People flock to Chris Cornell from disparate places but they unify in their appreciation of one of rock's most iconic voices, and one of the most gifted songwriters and guitarists to emerge from the '90s, who died on 18 May, aged 52. 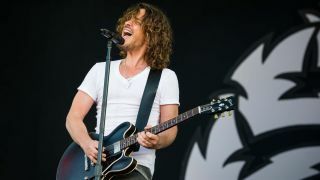 Consistently ranked among the upper echelons of best vocalist lists, and highly respected by his contemporaries and idols, Cornell cemented his position in the annals of rock history with landmark Soundgarden albums Badmotorfinger and Superunknown during the '90s, and experienced a second wind in the early 2000s with Audioslave, and more recently, his highly lauded, career-spanning acoustic tours. While Soundgarden made Cornell a household name among generation X, he was a furiously creative musician who strived to prove himself in all areas of his musical career. From tributes to fallen friend Andy Wood (Soundgarden/Pearl Jam supergroup Temple Of The Dog) to a newfound talent for acoustic fingerpicking (final solo album Higher Truth) and even hit-and-miss experiments with R&B (2009's Timbaland-produced Scream), he was constantly testing the boundaries of his songwriting ability. Born in Seattle, Washington and raised a Catholic, Cornell was a self-described “loner” in his early years and struggled with depression, forming Soundgarden in 1984 with bassist Hiro Yamamoto and guitarist Kim Thayil. It was this fusion of indie and hard-rock that won the band - joined by drummer Matt Cameron and bassist Ben Shepherd - a wide-ranging audience, which reached new heights, both in terms of success and Cornell's inimitable vocal range, with 1991's uncompromisingly heavy Badmotorfinger, spawning grunge anthems Jesus Christ Pose, Outshined and Rusty Cage, the latter of which was later covered by Johnny Cash. The band's creative peak came with Superunknown, however, an album that simultaneously embraced and eschewed the group's hard-rock leanings. Swinging from down-tuned menace (Mailman) to psychedelic surf-rock (My Wave) and proto-sludge (4th Of July), it showcased Cornell's increasing songwriting depth, exemplified by Black Hole Sun, a Beatles-worthy anthem for the end of the world. 1996's similarly diverse Down On The Upside followed, as did the band's break-up the year after. Yet Soundgarden picked up where they left off in 2010, resuming life as an active touring band and recording a now-final album of original material, King Animal. While Cornell was famed for his all-powerful wails (thanks to a formidable near-four-octave range), he spent much of his career apart from Soundgarden shaking the shackles grunge had placed on him. A desire to follow in the footsteps of his songwriting idols, Lennon and McCartney, saw him shifting from possessed frontman to brooding singer-songwriter for solo album Euphoria Morning in 1999. Lacklustre sales saw the record labelled a failure at the time, but it has come to be held as a high point in Cornell's body of work and one he frequently drew from during his marathon acoustic tours, which rejuvenated his solo career in recent years. During writing and promotion of his early solo material, Cornell struggled with substance addiction, yet that didn't stop producer Rick Rubin recommending he meet with three-quarters of Rage Against The Machine - Tom Morello, Tim Commerford and Brad Wilk - spawning supergroup Audioslave. The band's 2002 debut was a straight-ahead rock juggernaut that combined the Led Zep-esque swagger of RATM with Cornell's increasingly raw vocals. During the promotion of the album, the singer checked into rehab, and claimed he owed his sobriety to the band, stating they “saved my life”. The group became the first American rock band to play in Cuba in 2005, beating The Rolling Stones by a full 11 years, and released a further two albums in quick succession, but broke up in early 2007, citing personality and musical conflicts. This allowed Cornell to resume a solo career, kick-started by You Know My Name, theme song from Daniel Craig Bond debut Casino Royale. Cornell was a prolific writer for the screen, going as far back as Cameron Crowe's 1992 Singles soundtrack, and encompassing 12 Years A Slave (Misery Chain) and, just two months ago, the title track from The Promise. At the time of Cornell's death, Soundgarden were in the midst of a US tour and writing for their follow-up to 2012's first post-reunion release, King Animal. Following news of his death, Cornell's career choices during his final years take on a new light: he finished long-delayed Soundgarden reissues, finally toured with Temple Of The Dog, filled departed friend Layne Staley's shoes in Mad Season, and reunited with Audioslave. It's as if he wanted to tie up the loose ends in his legacy, to make peace with the ghosts that haunted him.